The Windows Store offers a wonderful world of content that you can buy and play on your laptop. 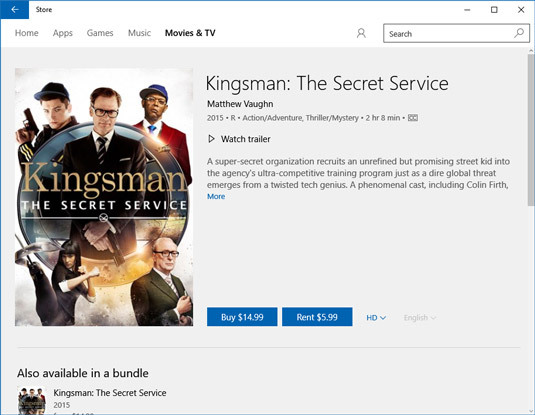 To shop for movies and TV shows, click the Start button and then click the Store tile. Click the Movies & TV link at the top of the window to get started. Scroll down to view titles in categories such as New Movies, Top-Selling Movies, Featured Movies, New TV Shows, and Top Selling TV shows. Click a featured title to view details or watch a trailer. If you’re looking for a particular title or movies with a particular actor, use the search field at the upper-right corner of the window. Click Buy. If you click Rent at this point, you’re taken through a similar sequence of steps. If requested, enter your Microsoft account password. If you don’t already have payment information associated with your Microsoft account, you’ll be asked to enter payment information. 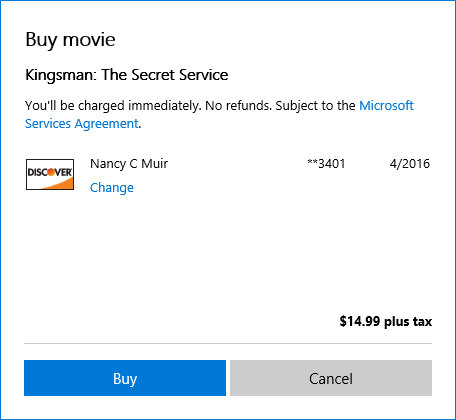 In the Buy Movie window, click the Buy button. The movie is added to Your Video Library in the Movie & TV app.